It is finally here, Sonic fans! The moment we have been waiting for over a year, the triumphant return of Sonic the Hedgehog to the world of comic books! You may have read my spoiler free review a couple of weeks ago, but now I am ready to give Sonic’s newest adventure the full treatment. The scene opens with a narrated montage of Sonic‘s many battles with the Evil Dr. Eggman‘s maniacal robotic weapons over the years. Sonic’s battles against the Egg Viper, Egg Emperor, Egg Dragoon, and most recently, the Death Egg Robot are featured. Despite Sonic’s seemingly inevitable victories, Eggman would always strike back after each defeat. However, this time the mad scientist has disappeared without a trace leaving his roving hordes of Badniks to terrorize the world without direction. Coming across a town under attack in the distance, Sonic decides to investigate and lend a hand. Within the town, one of the citizens, a wolf wielding a cube wispon hammer, directs two others to retreat to a bunker while he heroically fends off the advancing Egg Pawns. As the two others escape, the lone male wolf readies his wispon, but is visibly trembling in fear. An Egg Pawn strike him, knocking away his wispon and toppling him to the ground. Just as the Badnik reaches to apprehend the citizen, Sonic spin dashes onto the scene destroying the nearby Egg Pawns to the citizen’s relief. Sonic helps the wolf to his feet and returns his wispon noting that he knew someone who once put such a weapon to good use. Starstruck, the citizen babbles about how it is actually the Sonic the Hedgehog who saved him. Sonic dismissively humors him and runs off to continue helping the townspeople and routing the attacking Badniks. Around the corner, Sonic comes across a band of militia members and directs them towards the lone citizen in order to provide him with assistance. Elsewhere, the two citizens who escaped previously are desperately attempting to open a bulk head, presumably the entrance to the aforementioned bunker, while a trio of Motobugs closes in on them. Once again, Sonic swoops in at the nick of time, smashes the Badniks, give the couple a knowing wink, and then speeds off to his next destination. The pair also swoons over the encounter, the female cat concluding that the ordeal might be worth it if Sonic winked at her, whilst the male bird just hopes he can get an autograph after the battle ends. Meanwhile, Sonic comes to a sudden halt with an annoyed expression on his face, as the mallet of a giant hammer comes smashing down right in front of him. Sonic recognizes it as a Super Badnik, an Egg Hammer specifically, and comments how he liked the other “hammer guy” he ran into earlier better. Sonic battles the Badnik which is able to deflect his attacks and draws him into an open square where several more Egg Hammers are lying in wait to ambush him. In one coordinated attack, the four Egg Hammers surround Sonic and strike at him in unison. Sonic manages to take cover within a manhole that, conveniently, was directly under him when he landed in the square. He quips that the definition of a “Hedgehog” is a “borrowing mammal”. The Egg Hammers pursue Sonic, who is impressed by how fast they can move when they want. Sonic apprehensively kicks it into high gear as another hammer strike bears down on him. Suddenly, out of nowhere, Tails swoops in and pulls Sonic into the air setting them both down safely on a nearby roof. Tails chides Sonic, asking him if he is able to not risk his life for 5 minutes to which Sonic unabashedly replies affirmatively, but where is the fun in that? Not to appear an ingrate, Sonic seriously thanks Tails for the save, to which Tails happily obliges. Together they assess the status of the town and decide that the local militia should be able to handle the smaller Badniks, but that the Super Badniks should be handled by professionals like them. Together Sonic & Tails leap from the rooftop and perform a rolling combo splitting the first Egg Hammer completely slicing it in half. The two stick a three point landing and exchange a knowing glance before moving on to the next opponent. Tails takes to the air as Sonic performs a super peel out, and Tails uses his momentum to fling him into the next Egg Hammer, smashing its nose. Sonic strikes a picturesque pose atop the Badnik’s head as Tails knocks the behemoth to the ground. The third Egg Hammer attempts to squash Sonic, but instead finishes off his sibling as Sonic leaps away to knock the Badnik’s hammer into itself, destabilizing it enough so that Tails can strike the finishing blow. Tails comments on how things would have gone much faster if Knuckles was there to help, but Sonic dismisses the idea, assuring Tails that they are fine on their own. The remaining Egg Hammer begins to retreat along with the remaining smaller Badniks. Sonic warns Tails that they cannot afford to let them escape so that they can just attack another town, ordering Tails to cut them off while he takes out the final Egg Hammer. Sonic breaks the remaining Egg Hammer’s ankle from behind, and it attempts to swat him with a backhanded swing to no avail. Sonic runs up the hilt of its hammer and smashes its head. Sonic performs a three-point landing ahead of the broken bot as it collapses impaling itself on the hilt of its own hammer. Sonic then notices that the remaining Badniks are about to escape through the town’s gate and calls to Tails to stop them before its too late. Tails lands atop the rampart near a lever controlling the gate and in offended tone calls Sonic “Ye of little faith”. With impeccable timing, Tails pulls the lever just before the Badniks reached the gate causing them to crash into it and smash themselves to pieces. Tails flies down with a smirk, his hands prostrate waiting for praise and apology from Sonic who remarks that his maneuver was expertly done and awards him bonus points for timing as he applauds him with a cordial golf clap . Tails bows and thanks Sonic in an aristocratic manner. With the danger dispelled, Sonic declares another day saved by the heroes Sonic and Tails, noting that the rogue Badniks are little more than pests. However, Tails is not so sure, adding that they seemed far more organized than usual. Sonic dismisses the idea in a cocky tone, with Tails shooting back an unimpressed glare. Sonic admits that the Egg Hammers were new to the mix, but Tails asserts that it is more than that. Tails cites that it is highly unusual to see such a coordinated attack where Super Badniks are deployed to perform an ambush. He theorizes that Dr. Eggman might be behind it but that he would not have forgone his usual fanfare if he had indeed returned. Instead Tails opts for the theory that someone or something else is pulling the strings from the shadows. Sonic confidently states that if Tails is correct, he just needs to continue doing what he has been doing since the Badniks are a threat either way. Tails shows concern that if they are being organized that Sonic might get hurt again like he did before. Sonic reassures him that despite having many close calls in the past, they have always come out on top. Sonic promises to be careful, and Tails accepts. Sonic asks Tails to come with him on the mission like old times, but looking about at the town in disrepair and the grief stricken townsfolk, he decides to stay and help them rebuild. Sonic praises Tails noble decision and says they will team up to bash bots another time. Tails gladly accepts the offer. Ian Flynn and the editors have been very vocal and very clear about what to expect from the first four issues. Some people took them at their word, trusting Sonic was in good hands; others assumed the worse, bracing themselves for disappointment based on what they imagined the new book would be like. Despite all that, I am happy to say that Flynn has delivered on what he promised and more in this first issue. As promised, it is full of fast-paced action beats. Flynn wastes no time throwing Sonic into the fray, not that Sonic is one to stand idly around in the first place! First showing off the titular character’s return against some small fry then focusing on the camaraderie between him and his best buddy Tails as they team up to defeat the Super Badniks. Despite being action-packed, for each beat there is an emotional echo. Flynn might have surpassed the writing of Sonic Forces in conveying the fear and desperation the townsfolk were experiencing as their home was being invaded, as well as the compassion and concern Sonic and Tails felt for their plight. Likewise, the relationship and back and forth between the duo is dynamic as the combo moves they use to fell the Egg Hammers. Speaking of Sonic Forces, I believe we can finally put to rest the debate as to whether or not the IDW series is picking up where Forces left off. There are a plethora of subtle and not so subtle references to the game strewn throughout the first book. Beyond the consistent tone, the montage on the opening page displayed several of Dr. Eggman’s most nefarious creations with the final one shown before noting that Eggman has disappeared after his most recent defeat is the Death Egg Robot. Furthermore, the towns people directly resemble the species and body types seen in Forces, in addition to them wielding various wispons. If that was not enough, the Resistance is referenced several times as well. Some might cite that the Badniks are not the ones featured in Forces. While this is true, I can see, aesthetically, why they would go with the more interesting Egg Pawn designs rather than the duller ones from Forces. It seems to be more of an artistic choice than a world building issue. But perhaps the most obvious nods come from character interactions with Sonic. His run in with the lone militia member being the first. The character bears a resemblance to the “Rookie” character from Forces, being a male wolf wielding a wispon, and Sonic implies that he reminds him of the Rookie and how he used wispons to help defeat Eggman and Infinite. It is also strongly implied after the battle when Tails expresses his concern that Sonic might get hurt again. An obvious reference to when he was captured by Infinite and tortured by Eggman for months. Despite all these references, Flynn never comes out and directly says that these events follow Forces, but he has stated in several appearances that he heavily drew from it while writing these issues. As I said before, even if Forces was not a masterpiece of story telling, it provides an excellent template for someone like Flynn to expand on going forward. On that note, I would also like to speak to the fears that Flynn would not include world building in the books, and that it would just consist of shallow action stories without plot or depth. First of all, this idea merely comes from people misconstruing Flynn’s statements that the first few issues would be focused mainly on action rather than intricate world building. I think it makes sense to do a flashy introduction to start off the new series and celebrate the core characteristics that make Sonic and his most well known friends and allies unique before you get into any heavy plot developments. Regardless, let me assure you, there is no lack of world building already in this first book. As previously stated, this book is not merely 20 pages of Sonic smashing robots and making witty retorts(although that is definitely part of it). We see a world in disarray, the dynamics of Sonic and Tails deep and complex friendship, and the introduction of a mysterious new antagonistic force. This book definitely has some meat to it, especially considering that Eggman will not even be making an appearance for 4 more issues! Likewise, we must remember that this is a completely new universe. Despite Flynn and much of the creative team being old hands at making Sonic comics, this is a new deal altogether. Even if you are familiar with the likes of Tails, Amy, Knuckles, and Blaze, these are the first appearance of these versions of the characters. These initial books will be setting the tone for their personalities, motivations, and place in this brave new world! References, Easter Eggs, and Nods Galore! Another thing the team at IDW stressed was that this book was going to be both something fresh and new so anyone can jump in and enjoy it, but at the same time aim to reward long time fans for their loyalty. In my opinion, they nailed it. If I was a new reader, I would not have had any problem following the action, and was delightful to see the bond shared between Sonic and Tails. As a veteran fan, I was overjoyed with the plethora of references to the games hidden within every page. There were iconic Badniks like Motobugs along side more modern enemies like Egg Pawns and Egg Hammers. The towns people can be seen wielding a variety of wispons in defense of their home. Sonic and Tails demonstrate the depth of their move pools performing spin attacks, drop dashes, super peel outs, rolling combos, and even the classic hoist that had so many 90s kids making their younger sibling play Tails just so they could reach those secret areas in Sonic 2! It was a delight to see so much attention to detail, and it just goes to show that Flynn, Yardley, and the rest of the team are true Sonic fans like us. As I stated previously, in the span of just 1 issue, Flynn succeeded where I believe Forces fell short. He managed to meaningfully portray the fear and desperation present in the people of Sonic’s world in the face of Eggman’s forces. Despite essentially being nameless extras, Flynn uses the townspeople to efficiently and seamlessly set the tone. The people live in fear of threat from Eggman’s mechanized minions, while at the same time being inspired by Sonic’s legendary hero status. While many seem willing to fight, albeit apprehensively, they are all awestruck and inspired when they get to encounter their hero, Sonic. They truly feel like real people existing along side the main characters rather than just props convenient for furthering the plot. Sonic blasts back into the comics in signature style, striking a good balance of confidence and cockiness as he playfully mops up the smaller Badniks while humoring his adoring fans. Dispatching the Egg Pawns and Motobugs with ease, Sonic takes time to quip and joke with the towns people he interacts with, but also shows real concern for their safety and desire to help organize them to help themselves. When faced with the somewhat more significant threat of the Super Badniks, we see Sonic use humor as a means of dealing with the real danger he is in. Interestingly, when Tails rescues him and shows concern for his safety, he responds with a quip which seems to come across as rather rude and callous, but quickly adjusts to a more serious tone and thanks him for his help. After this, we see him maintain this more focused attitude as he works with his old pal. Meanwhile, we see Tails fretting over Sonic, expressing concern about his safety several times, obviously affected by Sonic’s previous defeat and capture by Eggman. Tails is worried Sonic’s brash nature will put him in danger, and that he might lose his best friend. This, in addition to his concern for the townsfolk’s plight, demonstrated by his decision to turn down the opportunity to go adventuring with Sonic, shows Tails to be a highly compassionate and selfless character. We also see another side of Tails as he cuts off the Badniks’ escape at the gate. Sonic is confident and independent, and Tails is once again trying to prove his worth and be acknowledge by Sonic for his contributions. It is clear Tails wants to prove that he can keep up with his hero too. Tails is shown to be competent and intelligent, tactically stopping the Badniks as well as correctly piecing together that there is someone else besides Eggman controlling them. This is certainly not the Tails we saw in Forces! Altogether, I think Flynn was spot on with his representation of Sonic, and it sets the tone for his character well, but what really made this book shine is how they portrayed the historied and multilayered friendship between this iconic duo! While I may have said on several occasions that Tracy Yardley’s work is not necessary my cup of tea, (I think my main issue is that I do not like how he draws Sonic in particular), I do respect his style in general. He did a great job of stylizing the Badniks so that they are both recognizable, but unique. I also like his portrayal of Tails much more than that of Sonic, but ultimately, I must praise him for his action sequences. Tracy does a great job on making the action dynamic with constantly shifting perspective angles and easily followed motion cues when Sonic and Tails are running or spinning. While he repeats a few tropes like bouncing off a series of foes or the three-point landings, he does it slightly differently each time. However, I think the crowning achievement this issue are the Egg Hammers. There was something just so satisfying about the ambush panel; seeing the Super Badniks lying in wait and simultaneously swinging their gargantuan spiked mallets. Furthermore, we were then treated to Sonic and Tails teaming up to defeat each of the four Egg Hammers in a different way. I loved seeing each of their different tactics unfold: Sonic & Tails using a rolling combo to slice one in half, Sonic riding upon one’s head like some sort of revolutionary, and the final one being impaled on its own weapon. You can tell a lot of thought and effort went into making these action beats unique and interesting! Issue #1 is a veritable variant extravaganza! At last tally there are 12 different covers that have been announced with at least 2 of those to be revealed at a later date with various promotions! A significant portion are altered art of other covers such as black and white or sketch variants, but there is still a lot of diversity among issue #1 covers! Since this is my first IDW cover review I will go over some of their cover conventions quickly before I get into things. As far as I know, every issue will have an A and B cover that will be widely available through various retailers and distributors. However, there will be various RI (Retailer Incentive) covers that will be only available at brick and mortar stores that order a requisite number of copies of a given issue (10, 25, 100 copies etc.). Besides that, there are exclusives which are only available at certain events like conventions or notable stores like More Fun Games in Denton, Texas. For a full release calendar of all the variants, as well as any other IDW Sonic merchandise, checkout this link! Cover A by Tyson Hesse: Hesse will be illustrating the first 4 issues’ A covers. They will be “connecting covers” that when placed side by side in order will create one big picture. Issues #1-4 will show Sonic racing across the Emerald Hill Zone with his various allies featured in each issue! Cover B by Tracy Yardley: Based on the solicitations released so far, the theme seems to be that the B cover will be done by the interior artist of that issue. The WonderCon 2018 & C2E2 convention exclusive variants are black & white versions of this artwork. RI-A by Nathalie Fordraine: Retailers receive 1 copy of this variant for every 10 they order. Nathalie has been confirmed to be doing the 10 copy incentive for each issue at least through #7. This ties her with Hesse for the most covers so far, but has the most unique covers with no b&w or sketch variants. RI-B by Rafa Knight: Retailers receive 1 copy of this variant for every 25 they order. The last of the 5 retail covers to be revealed, Rafa is known for her 3D modeling skills and has done many covers for Archie’s Sonic and Megaman series. RI-C by Kieran Gates: Retailers receive 1 copy of this variant for every 100 they order. Kieran is known for doing much of the promotional artwork for the smash hit game, Sonic Mania, and is regarded as an expect in replicating the “official” style of Sonic game art. WonderCon 2018 by Tracy Yardley: Technically, the first cover to become available a couple of weeks ago at WonderCon in Anaheim. This cover is a black & white version of the B cover. More Fun Games by Devin Kraft: This cover will be available exclusively at More Fun Comics & Games in Denton, Texas. Devin is an artist local to the area. Superstar by Edwin Huang: According to editor, David Mariotte, this cover will be available at Tidewater Comic Con in Virginia (May 12-13). Edwin is known for his work on the Street Fighter and Skull-Kickers comic books. C2E2 by Tracy Yardely: Convention exclusive to the Chicago Comics & Entertainment Expo happening this weekend (April 6-8). It is identical to the WonderCon variant except it is marked as “Convention Exclusive Cover” rather than just “Convention Exclusive”. Diamond Retailers Summit by Tyson Hesse: Convention exclusive to the Diamond Retailers Summit (April 4-6), a convention for retailers in the comic book industry. This cover is a black & white variant of the A cover. Box Set: It was announced that a box set of issues #1-4 to be released in June will include a limited edition sketch variant of issue #1. Which cover it is a sketch of is unknown, presumably either the A or B covers. Crash Course by Kieran Gates: Those who pre-order the Crash Course board game by IDW games will receive this cover. This cover is a black & white version of the RI-C cover. Overall, I think issue #1 was an excellent way to kick off a new era of Sonic comics. Breaking down this first issues has only gotten me more excited about what is to come. It is clear Flynn and company have a wide open new world to work with and have some great ideas with which to fill it. If they can continue to hit this great balance of heart and action as they continue to introduce more heroes and villains alike, I have no doubt the new book will be overflowing with potential for years to come. Like many of you, I mourn the loss of Archie Sonic and what could have been, but I am rejoicing about what IDW Sonic is and is going to be! 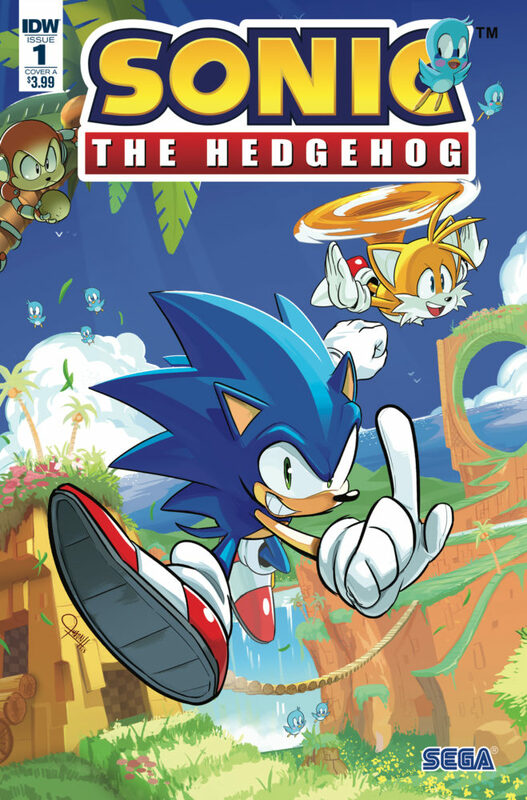 Thanks for reading our first review of IDW‘s new on going Sonic the Hedgehog series! We hope you enjoyed it and will come back for more! Sonic Source is regularly updated with the latest news and information regarding IDW Sonic and also offers useful resources like a character guide, cover gallery, timeline, and release calendar! How did you like issue #1? Did you agree with our assessment? Let us know your thoughts in the comments below! Next Issue #2 Jon Gray Cover Revealed!